A recommendation has been made by the Supreme Court collegium headed by Chief Justice of India P. Sathasivam that the Chief Justices of the Madras and the Delhi High Courts, Rajesh Kumar Agrawal and Nuthalapati Venkata Ramana, be appointed as judges of the apex court. There are chances that in the year 2021, Justice Ramana can become the Chief Justice of India and if that happens, he will be the second person from Andhra Pradesh after over five decades, to adorn the highest judicial office. Earlier, Justice K. Subba Rao was the CJI from June 1966 to April 1967. Justice Agrawal, 60, who was made active Chief Justice of the Madras High Court in February last year and appointed as regular Chief Justice in October, will be the second judge to represent the Allahabad High Court along with Justice Chauhan till July. He will have tenure of about five years. Justice Ramana, 56, will have a tenure of about nine years. Prior to becoming the Chief Justice of the Delhi High Court in September last year, he was appointed as a permanent judge of the Andhra Pradesh High Court in June 2000. Once Justice Agrawal is promoted to the Supreme Court, the list of 12 names recommended for appointment as judges of the Madras High Court will probably be sent to enable the new Chief Justice to be appointed to have a say in the selection process. On 13th January 2014, Live law reported about a campus conflict in Madras High Court over selection of candidates for appointment as judges. The story pointed out a senior judge has resigned from a total of 14 committees of the Madras High Court, on account of being upset at campus conflict in the Madras High Court over selection of 12 candidates for appointment as judges. The said judge in a letter to Chief Justice R K Agrawal has expressed his dissatisfaction at the current situation in the Madras High Court and stated that the recent developments had hurt him and therefore he immediately resigned from all the committees. Apparently, no one has ever quit the court committees like this judge has, following the turn of events at the Madras High Court. With the details of 12 names recommended by the collegium of the High Court in December 2013 becoming public, there have been demands by sections of the Madras Bar asking for its total recall. As of now, printing negative pamphlets against judges, naming even Chief Justice of India P Sathasivam, holding demonstrations and taking out rallies, are some of the steps that have been taken up by the Bar. Senior Advocate R Gandhi, who has also won an interim order of status quo, preventing the central and state governments from processing the list of names, had filed a PIL. The strength of the Supreme Court will be as per the required strength with their appointment, as it will be 31 judges in the Supreme Court. But this would remain for a very short span of time because 10 judges are due to retire this year. On 10th January 2014, Live law covered a story on the landmark change the Supreme Court will witness this year, which will be a turning point in the Court’s history, as this year will not just be bidding farewell to many eminent judges of the Supreme Court, but it will also be a year of new faces in the apex court, as out of the 15 senior-most judges, 11 will retire, including Chief Justice of India P Sathasivam and his successor R M Lodha. Justice H.L. 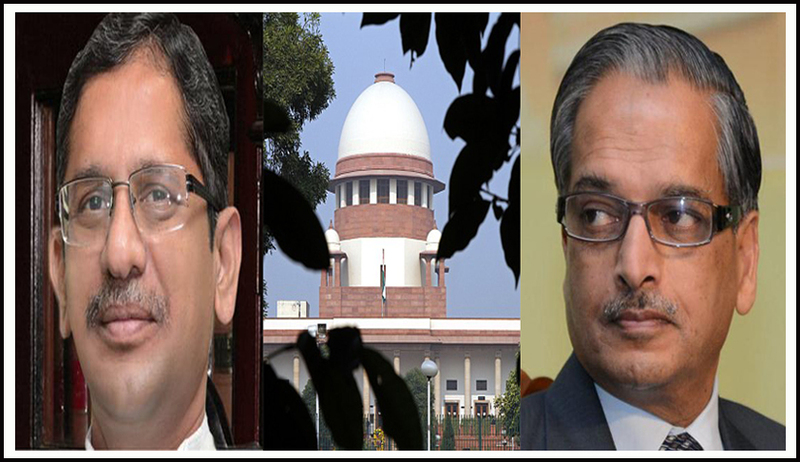 Gokhale will retire in March, CJI Sathasivam and Justice Gyan Sudha Misra in April, Justice K.S. Radhakrishnan in May, Justices A.K. Patnaik and S.S. Nijjar in June, Justices B.S. Chauhan and C.S. Prasad in July, Justice R.M. Lodha, who will be CJI for five months in September and Justice Ranjana Desai in October. Live law reported that with an approved strength of 31 judges including the Chief Justice of India, the Supreme Court is functioning with 28 judges and considering the large number of retirements this year, it will be a huge responsibility on the collegium headed by Chief Justice of India P Sathasivam, which comprises Justices Singhvi, Lodha, Dattu and Chauhan to quickly fill the vacancies by recommending names much before the posts fall vacant. Keeping in mind the Supreme Court’s pendency rate, which is on a gradual rise, and very soon can go up to 70,000, it is critical for the Chief Justice of India to consult his colleagues to formulate a vital mechanism for immediate disposal of cases.